Ambitious mid-range device 4.6-inch display with HD resolution, powerful hardware and a design similar to the Xperia Z top model's: At the first glance, the Sony Xperia SP appears to have all advantages on its side. Our test uncovers what the smartphone can really do. The Xperia SP is a sister model of the recently reviewed Xperia L. Apart from their size, the two models are quite similar. The Xperia SP features a bigger LC display (4.6-inch diagonal instead of 4.3-inch), a higher resolution (1280x720 pixels instead of 854x480), and a slightly more conservative (as in less curved) plastic / aluminum case. The latter for example lacks the slightly concave rear side of the Xperia L.
However, the inner components do not reflect the conservative look. 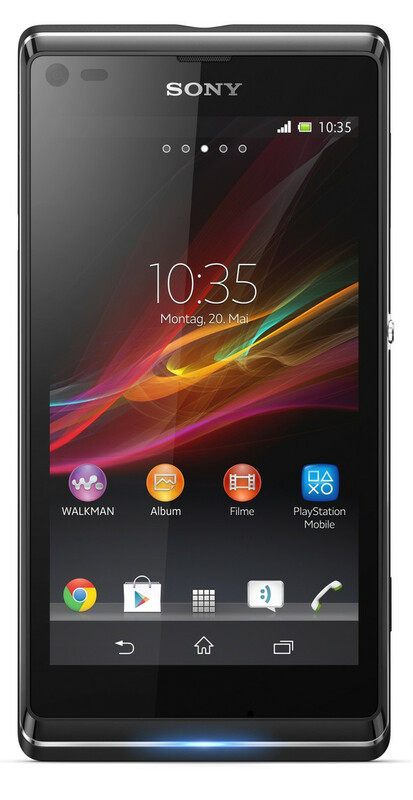 While the Xperia L is an entry-level device, the Xperia SP is aiming high. 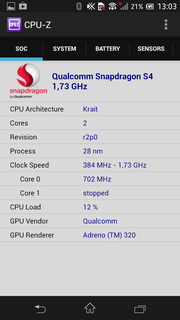 With the Qualcomm Snapdragon S4 MSM8960T, the test sample comes with a high-end SoC with a clock rate of 1.7 GHz. The remaining specs are also impressive: a Qualcomm Adreno 320 graphic chip, 1 GB RAM, and 8 GB internal memory. 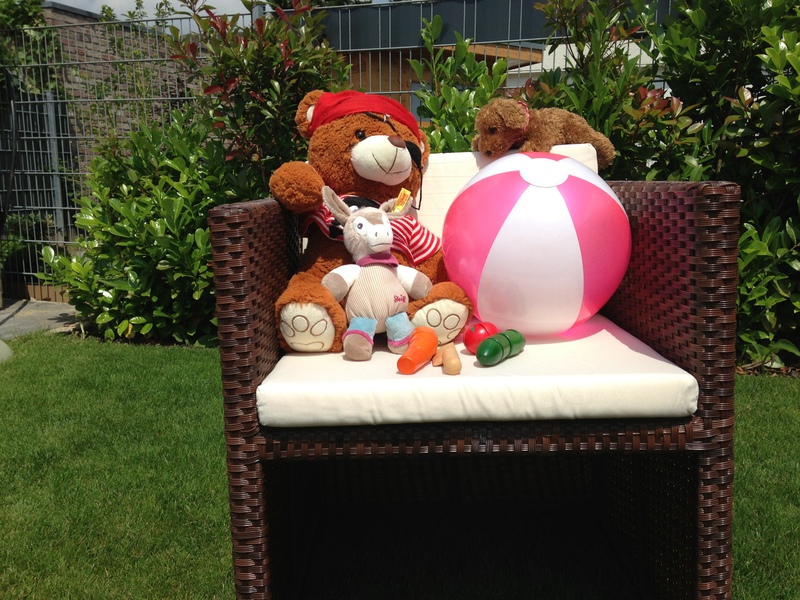 In addition, the smartphone features a seven MP main camera and runs the Android 4.1 Jelly Bean operating system. 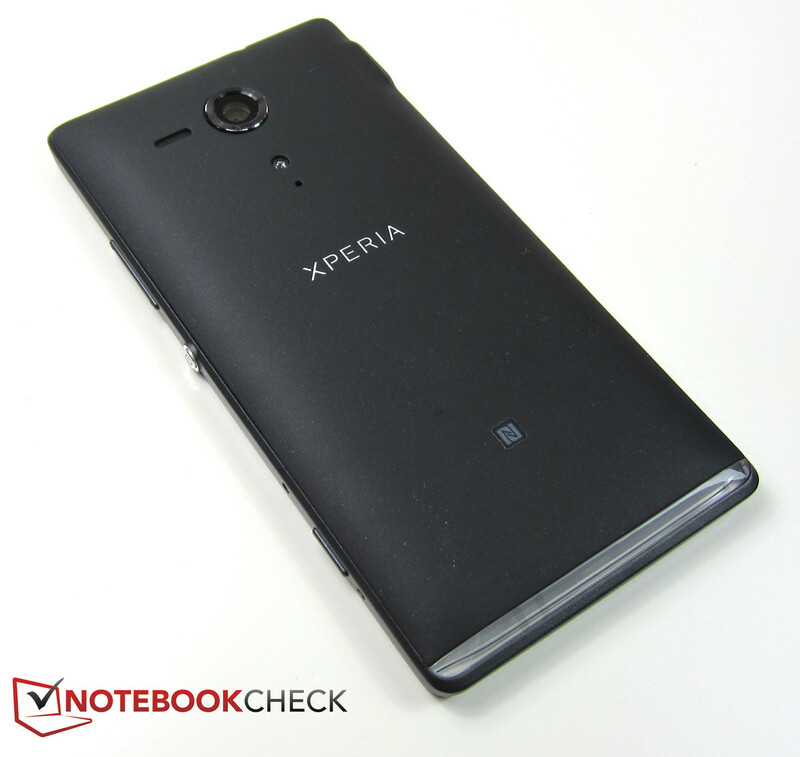 We scrutinized the black model of the Xperia SP. Sony also offers the Xperia SP with a red or a white case. 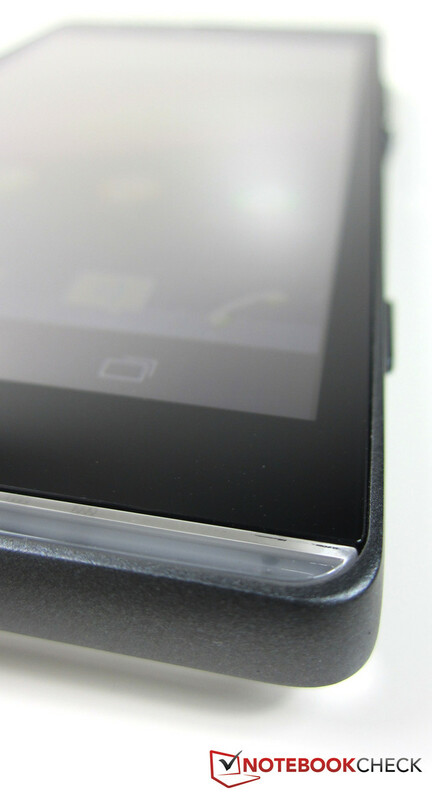 Of course, the Xperia SP also comes with the Xperia trademark: a silver power button, in the middle of the right side, which sticks out of the case. The latter features an aluminum frame and convinces with a high-end build quality. The smartphone does neither wrap nor creak from side-to-side twisting. 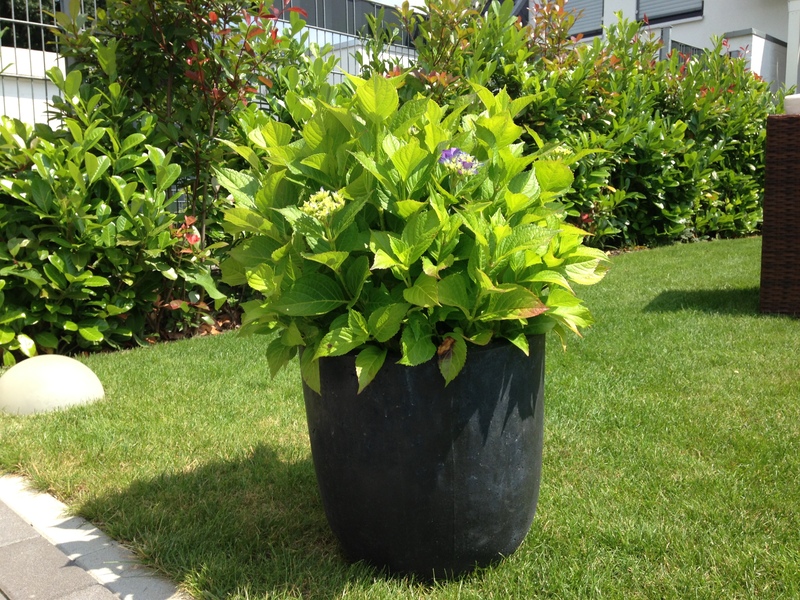 The rubberized rear side ensures a secure grip so it is unlikely to be dropped accidentally. The light bar at the lower edge is an interesting feature. Depending on app, event, and selected design it glows in different colors. 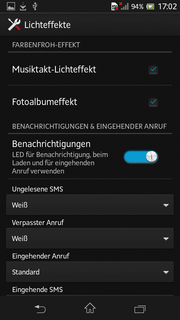 The light effects can be precisely specified in the Android settings. The reflective 4.6-inch display with 1280x720-pixel resolution is protected by scratch-resistant Corning Gorilla Glass and seamlessly integrated into the case. The webcam above the display only features a low resolution of 640x480 pixels (0.3 MP), while the main camera's resolution of seven MP (max. 3104x2328 pixels) is significantly higher. 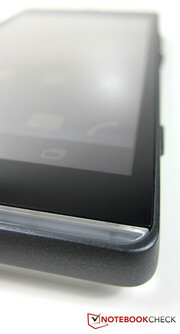 There is a small, inconspicuous rectangle below the Xperia logo, the NFC sensor. The size of 130.6 x 67.1 x 9.98 mm (~5.14 x 2.64 x 0.39 inches) and the weight of 155 g (~0.34 pounds) are typical for smartphones of this size. The Sony Xperia SP features a powerful Qualcomm Snapdragon S4 MSM8960T SoC, which is also incorporated in powerful competitors, e.g. Nokia's Lumia 920, Samsung's ATIV S or BlackBerry's Z10. The ARM-based dual-core processor is assisted by a Qualcomm Adreno 320 graphics processor. 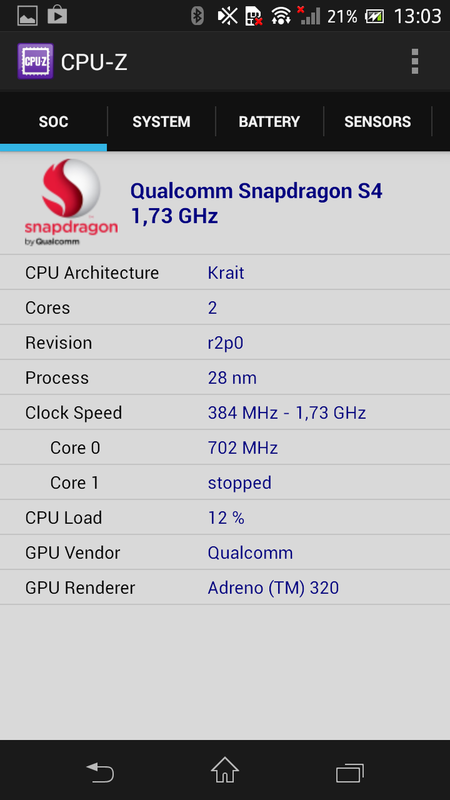 With this CPU and GPU, the Xperia SP should run smoothly and quickly. 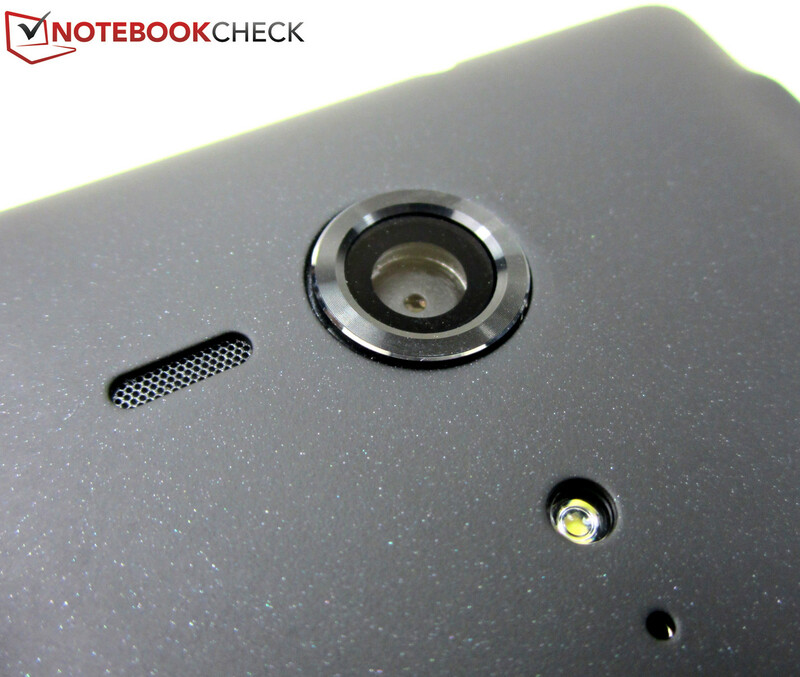 The Xperia SP features 8 GB memory, but this specification should be taken with a pinch of salt. The smartphone firmware for the Android OS and the already preinstalled apps occupy about 3 GB and only 5 GB are free initially. Nevertheless, the storage capacity should suffice in the majority of cases unless you install a lot of apps or a huge amount of pictures or videos. Nevertheless, the smartphone is prepared for such scenarios. 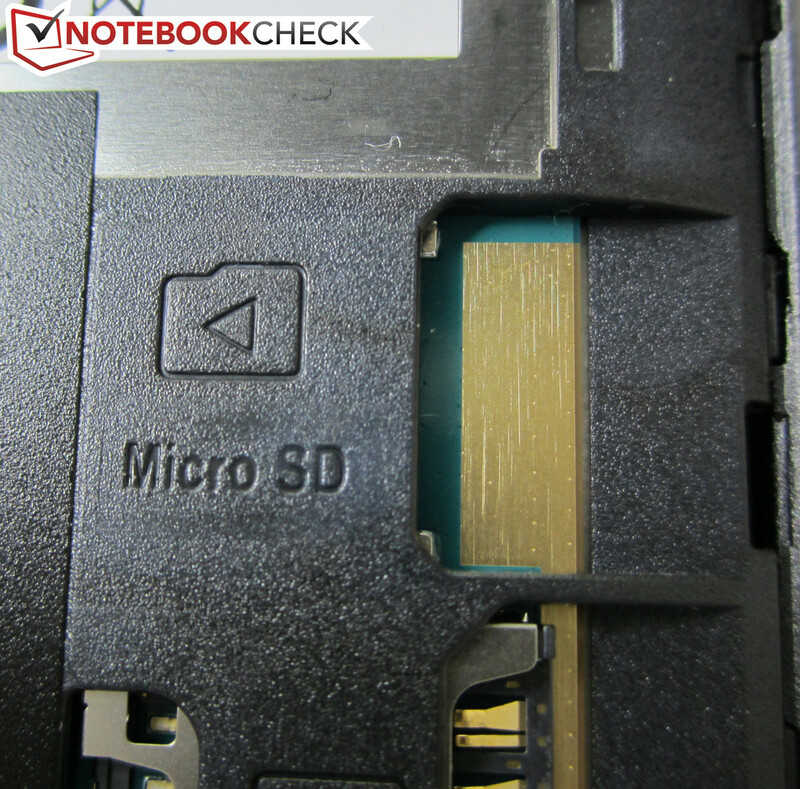 You can expand the memory capacity by a further 32 GB using the micro SD slot beneath the rear cover. 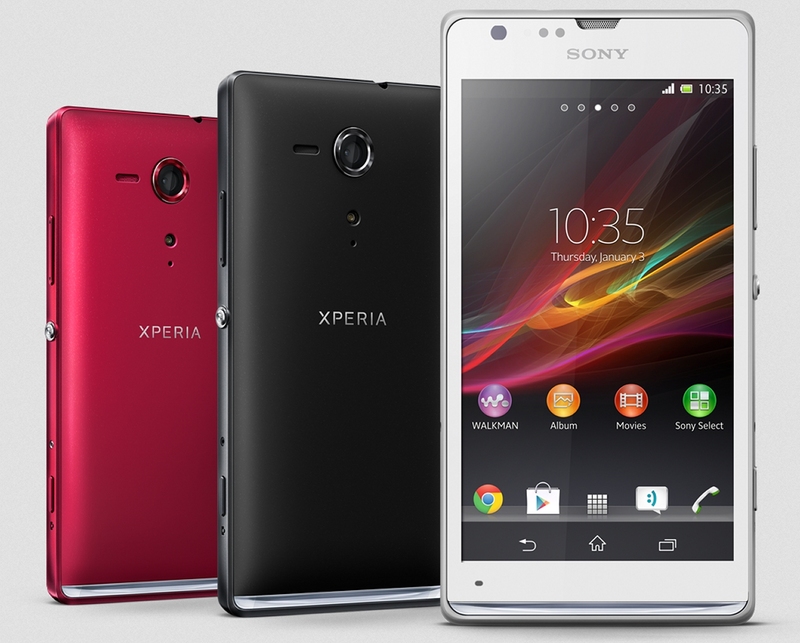 Sony pre-installs the Android 4.1 Jelly Bean OS and several apps on the Xperia. Apart from Google Play, the Google Chrome browser and the Sony Walkman app, apps like YouTube, Facebook, Navigation, UKW radio, Google+, and Gmail are available, too. 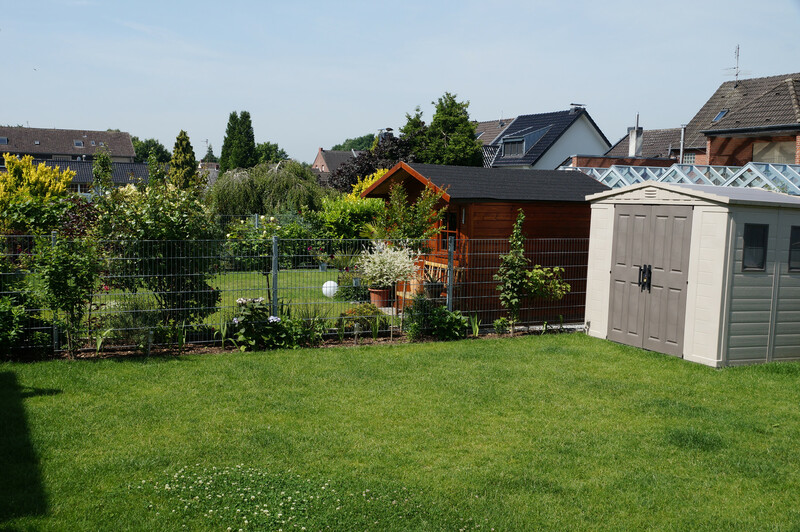 The aGPS-Sensor of the Xperia SP allows a precise location. The Xperia SP supports nearly all radio networks including UMTS quint band (850, 900, 1,700, 1,900 and 2,100 MHz) and GSM quad band (850, 900, 1,800, and 1,900 MHz). So, you can use the Sony smartphone nearly everywhere in the world. Thanks to HSPA+ acceleration download rates of up to 42 MBit/s are possible in UMTS networks. In addition, it supports LTE, a fourth generation mobile communications standard, which allows a maximum transfer rate of 100 MBit/s according to the manufacturer. In our test, the Xperia SP delivered a high speech quality during phone calls into the mobile phone as well as fixed networks. For local data transmission, the smartphone features WLAN 802.11 a/b/g/n and Bluetooth 4.0, which both convinced with a stable send and receive performance. The same is true for the GPS sensor, which allows a fast and precise location and could even detect many satellites indoors. The NFC module allows a contactless transmission of small amounts of data over a very short distance. So, you can use the Xperia SP as digital wallet or virtual ticket. As there are only a few applications so far in Germany, NFC is, at best, a feature for the future. The Xperia SP features two cameras. The 0.3 MP (640x480) webcam on the front side only achieves VGA quality, but is appropriate for video telephony and snapshots. 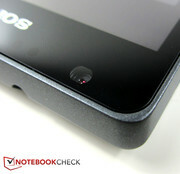 The main camera on the rear side is more apt for photos as it features a maximum resolution of 3104x2328 pixels, i.e. up to seven MP and an LED flash and can record 1080p videos. The main camera delivers a decent image quality, but it performs worse than our reference camera and several high-end competitors. 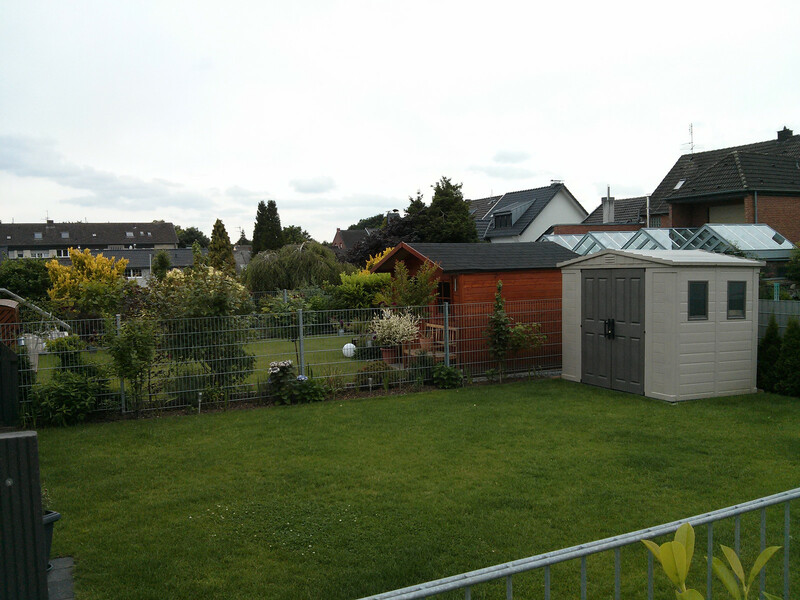 Overall, photos shot by the Xperia SP are not bad, but the color saturation is too high. 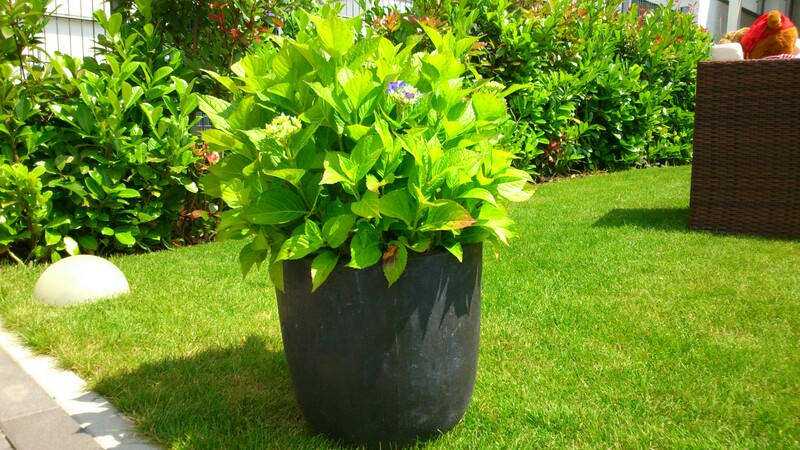 As a result, pictures are colorful at the expense of many details. In direct comparison to the competition, they appear too bright. 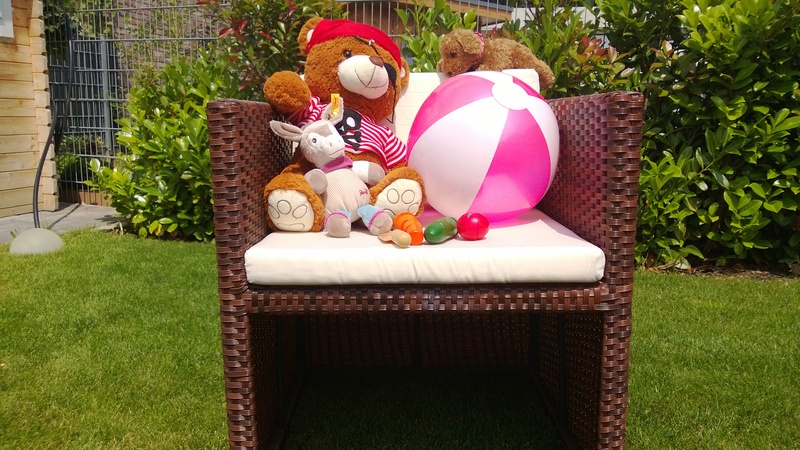 In addition, the images are already slightly noisy if taken in light shade. Sony offers several accessories for the Xperia SP including a Bluetooth headset (SBH20) and wireless speakers (Smart Mini Music Box). The warranty period of the Xperia is 24 months. Accessories and built-in battery have a warranty of 12 months. The display surface protected by Corning Gorilla Glass allows a comfortable, smooth handling. The display supports inputs with up to 10 fingers and reacts precisely to multitouch gestures. Because of the fast SoC, the Xperia SP reacts fast and responsively to commands. A smooth navigation is also possible immediately after booting. 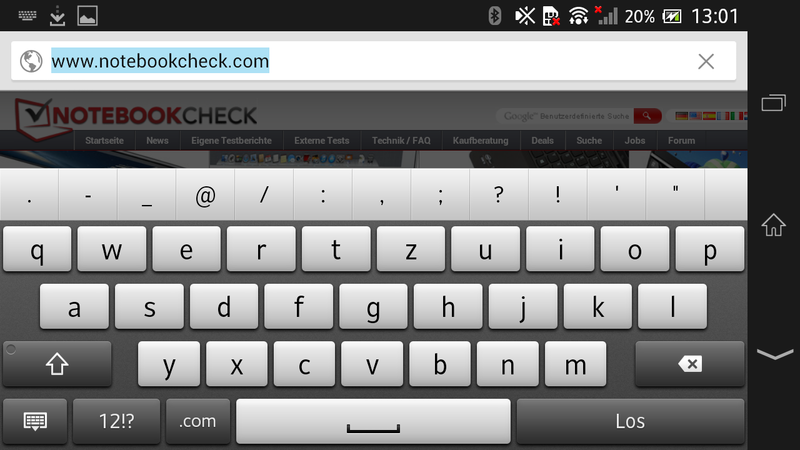 Thanks to the big display, you can easily use the virtual QWERTZ keyboard. In particular, in landscape mode, the display keyboard scores points with conveniently big inter-key gaps. 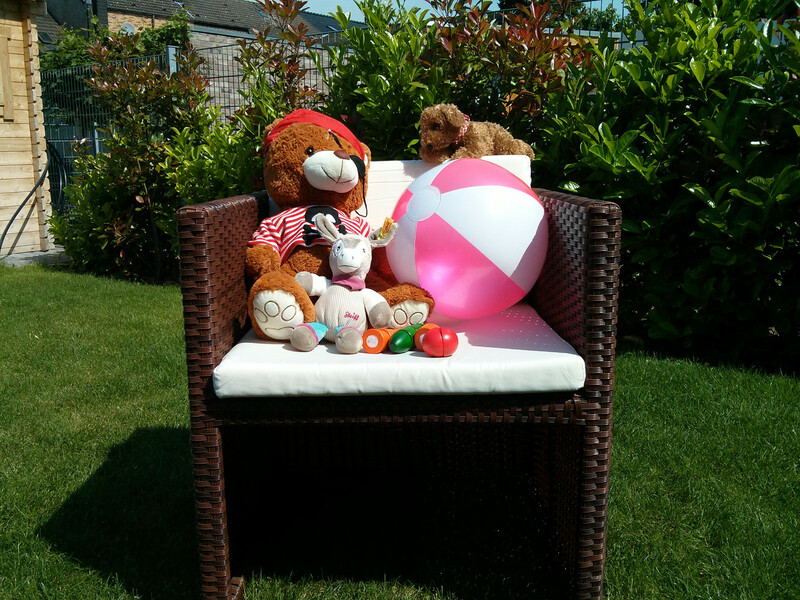 In addition, the keyboard layout is handy as are the additional screens for numbers and special characters. The 4.6-inch TFT display of the Xperia SP features a resolution of 1280x720 pixels, which is usual for smartphones of this size. For example, the HTC One X has exactly the same display format and the Google Nexus 4's and the LG Optimus G E975's (1280x768 pixels each) is nearly identical. Only the Samsung Galaxy S4 Mini is quite different with a resolution of 960x540 pixels, but 4.3-inch device is also significantly smaller. 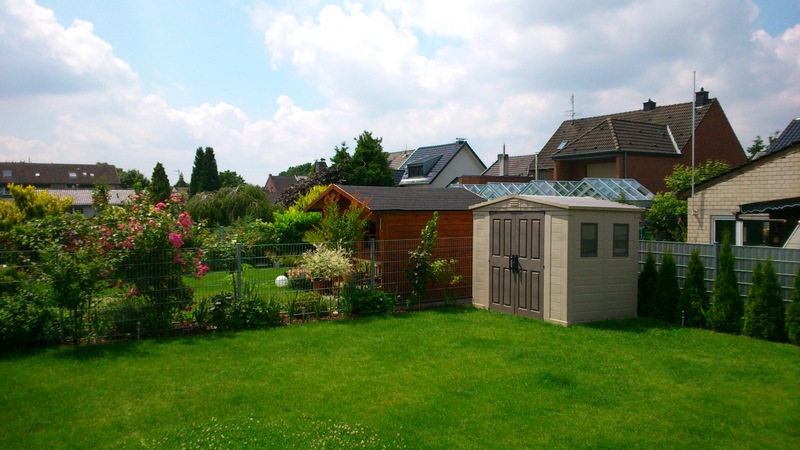 The average brightness of 389.3 cd/m² is more than sufficient for outdoor use. Furthermore, we appreciate the very even distribution of brightness of 95%. The brightness of the brightest and the darkest display segment only differs by 20 cd/m² – a very small difference. Most competitors are not that bright, e.g. 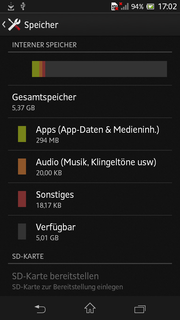 the Google Nexus 4 (275.3 cd/m², 93%) and the Samsung Galaxy S4 Mini (297.8 cd/m², 81%). 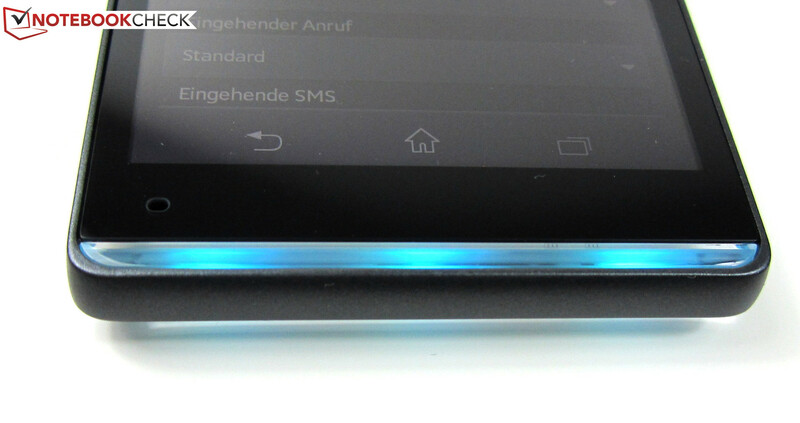 In contrast, the HTC One X features a very bright display (448.4 cd/m²) with a very even distribution of brightness of 93%. The, at best, average black value of 0.6 cd/m² and the modest contrast ratio of 670:1 are disappointing. In practice, black is not absolutely black, but this is hardly noticeable and not a minus point. However, the competitors perform significantly better here. The HTC One X (1225:1) takes the lead and the Google Nexus 4 (1179:1) and the LG Optimus G E975 (1039:1) follow closely. Because of the AMOLED technology, the Samsung Galaxy S4 Mini's contrast cannot be precisely measured. 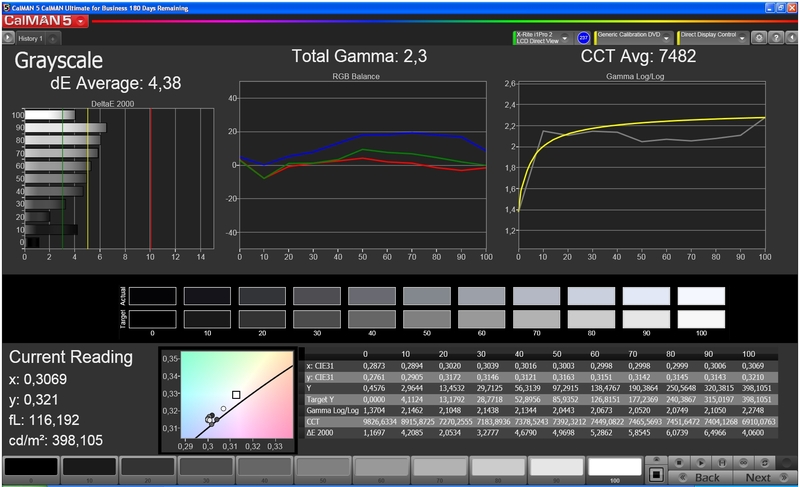 The color analysis with the CalMAN 5 software and the X-Rite i1Pro 2 colorimeter uncovers weaknesses typical for smartphones. 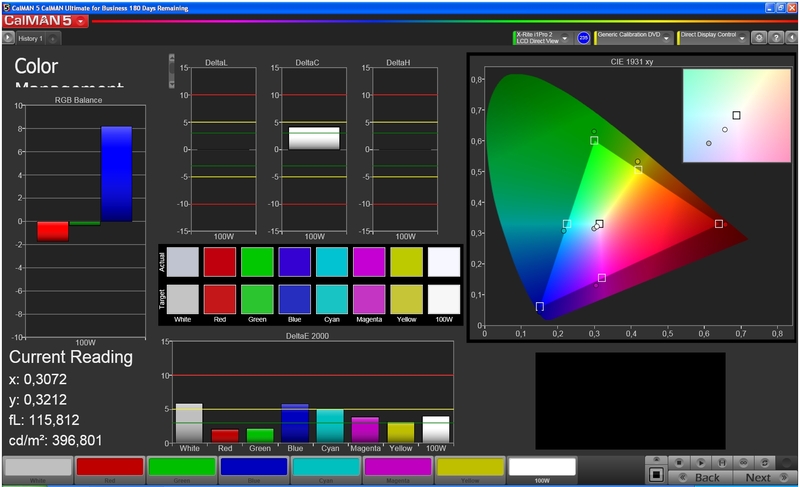 In particular, the blue tones significantly deviate from their ideal values in the sRGB color spectrum. The same is true for brighter gray levels. Overall, the results are fine for a smartphone. 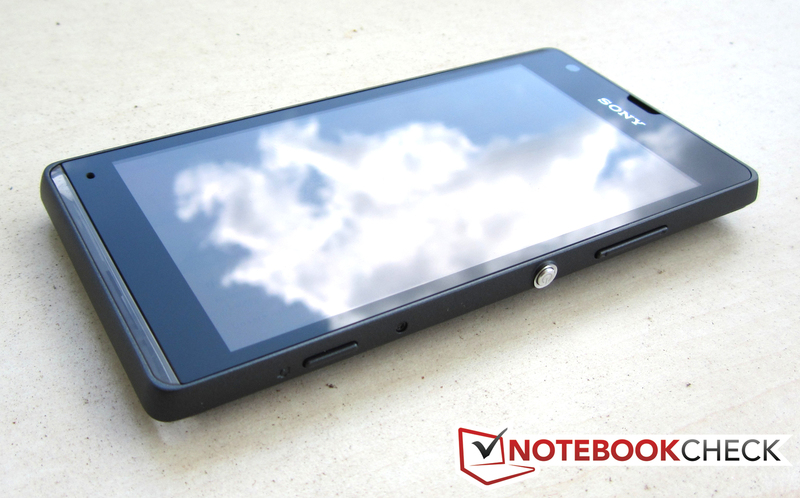 Due to its bright display, the Xperia SP is readily appropriate for outdoor use. As with nearly all other smartphones, the reflective display is disturbing. 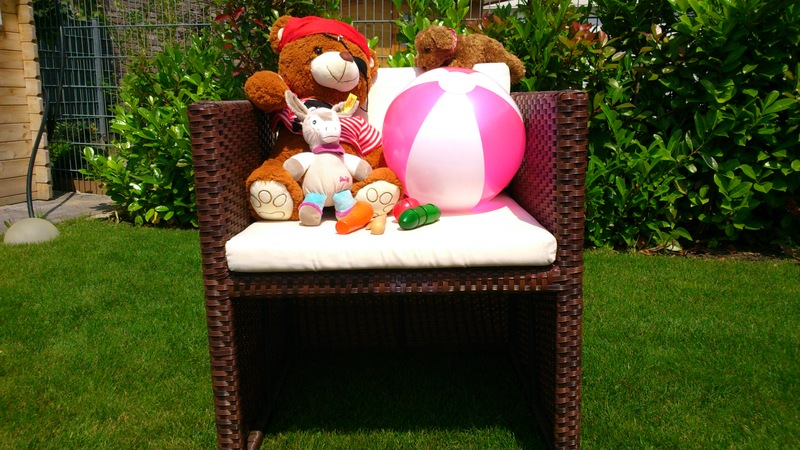 However, as long as you avoid direct sunlight, you will face little to no restrictions outdoors. The viewing angles are average at best. The color saturation falls notably at slight horizontal deviations while the brightness increases. The bigger the deviation, the more the colors fade. 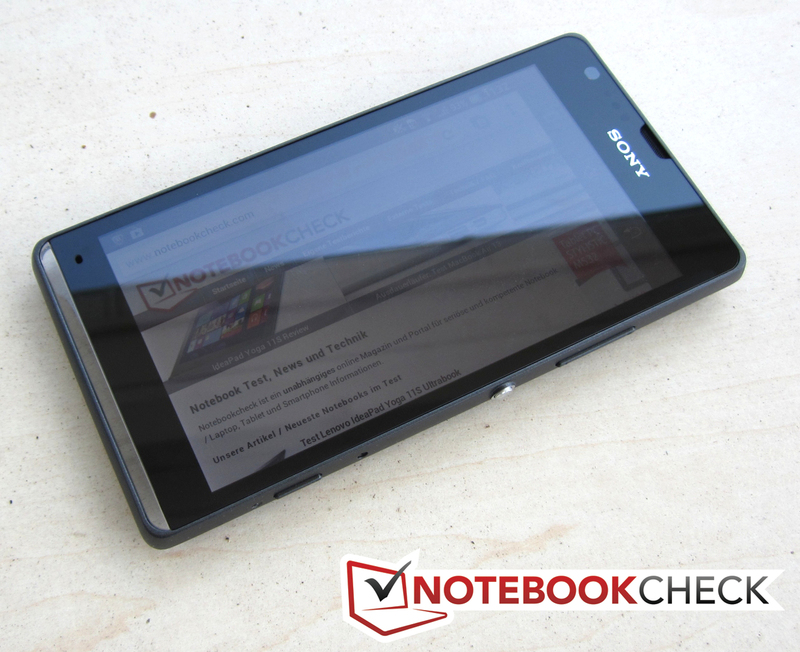 The Xperia SP does not need to feel ashamed in terms of performance. Quite the opposite is true: The Qualcomm Snapdragon S4 MSM8960T high-end SoC (clock rate: 1.7 GHz) and Qualcomm Adreno 320 graphics chip provide high performance in the benchmarks. In the synthetic benchmarks, the Sony smartphone is on par with the Google Nexus 4 and the HTC One X. Overall, the LG Optimus G E975 and the Samsung Galaxy S4 Mini are slightly faster. There is no clear winner in the Browser benchmarks. All benchmarks considered, they are about on par. In reading and writing, the Xperia SP is about as fast as the Samsung Galaxy S4 Mini and, so, rather slow compared to the competitors. The Google Nexus 4 and the LG Optimus G E975 perform significantly better and are even three times faster in 4 KB Random Writes. The integrated Qualcomm GPU Adreno 320 is more than fast enough for the latest games. The 3D chip can run smoothly all games and does not even struggle with more demanding titles like Shadow Gun: Dead Zone or Zombies vs. Plants. The touchscreen reaction is responsive, fast, and reliable in all games. Under maximum load, the temperature of the Sony smartphone increases up to a moderate 42 degrees Celsius (107.6 degrees Fahrenheit), one of the lowest temperature rises in the comparison. The Samsung Galaxy S4 Mini (41 degrees Celsius/ 105.8 degrees Fahrenheit) and the LG Optimus G E975 (41.9 degrees Celsius/ 107.42 degrees Fahrenheit) remain slightly cooler. The HTC One X is literally a very hot smartphone (52.8 degrees Celsius/ 127.04 degrees Fahrenheit). (±) In idle usage, the average temperature for the upper side is 35.6 °C / 96 F, compared to the device average of 33.1 °C / 92 F.
For audio playback, the Xperia SP features a mono speaker with decent sound, which is even not distorted at maximum volume. However, it lacks mid tones and especially the basses. The included in-ear headphones, which can be connected to the smartphone via 3.5 mm jack, significantly improve the audio experience. While idle, the Xperia SP requires between 4 Watts and 1.8 Watts and so does not belong to the most frugal devices. This impression is confirmed under load. 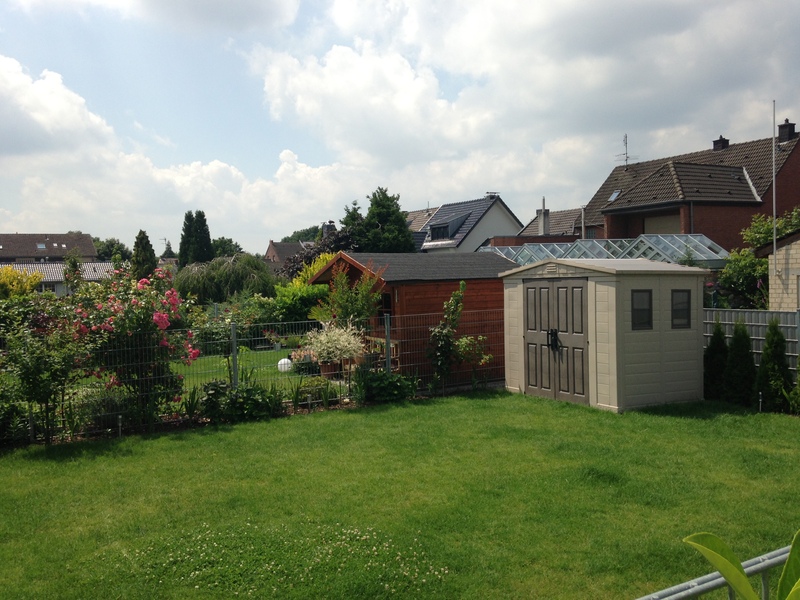 Here the test sample needs between 3.9 Watts and 5.6 Watts. The LG Optimus G E975 (maximum: 3.7 Watts) and the Samsung Galaxy S4 Mini (3.9 Watts) work significantly more efficiently. Just the opposite is true for the HTC One X (5.8 Watts) and the Google Nexus 4 (6.4 Watts). With maximum brightness and all Wi-Fi modules activated, the Xperia SP achieves a minimum battery life of 2 hours and 40 minutes. Therewith, the smartphones still belongs to devices with long battery life and is on par with the Google Nexus 4 and the Samsung Galaxy S4 Mini (2 hours 39 minutes each). 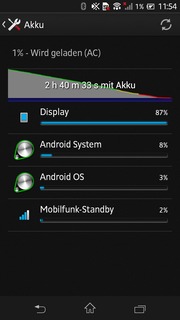 The battery of the HTC One X is very quickly emptied (1 hour 52 minutes). The maximum battery life of 14 minutes and 4 minutes (minimum brightness, all Wi-Fi devices apart from WLAN deactivated) is only average. Many competitors including the Samsung Galaxy S4 Mini (19 hours 52 minutes), the LG Optimus G E975 (18 hours 15 minutes) and the HTC One X (17 hours 17 minutes) last significantly longer. In the especially realistic WLAN test (brightness: 150 cd/m², script loads new web pages every 40 seconds) the Xperia SP achieves 7 hours and 20 minutes. The Google Nexus 4 is on par, the HTC One X achieves even 8 hours and 56 minutes. However, the Samsung Galaxy S4 Mini (12 hours 10 minutes) and the LG Optimus G E975 (11 hours 10 minutes) remain unbeaten. 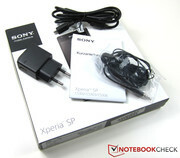 With the Xperia SP, Sony created a successful bundle. Because of the built-in Qualcomm-SoC Snapdragon S4 MSM8960T, the decent performance of the 4.6-inch smartphones suffices to run the latest games and apps smoothly and without lagging on the 1280x720 pixels screen. However, the components inside the elegant case should be even faster for a high-end smartphone. 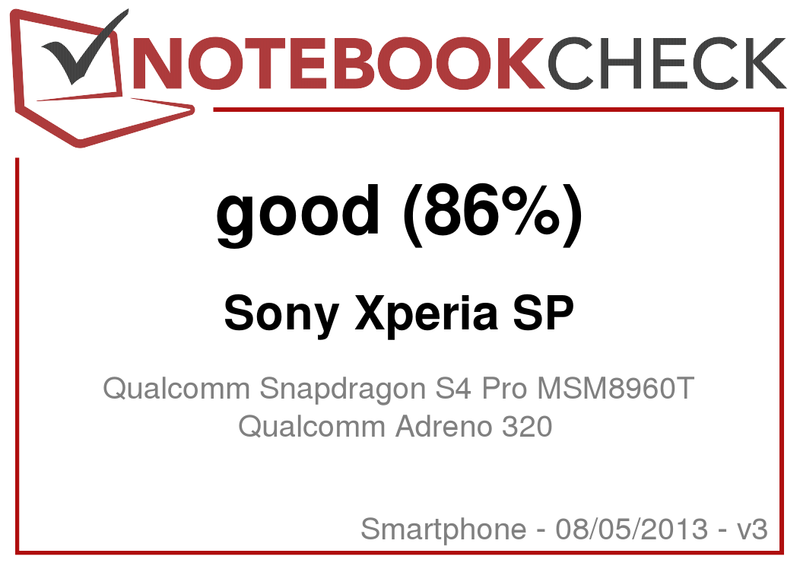 The Xperia SP performs only average in several aspects, i.e. battery life and display. We liked its high-end build quality, the good responsiveness, the numerous communication modules and the fair sized free storage capacity of 5 GB. 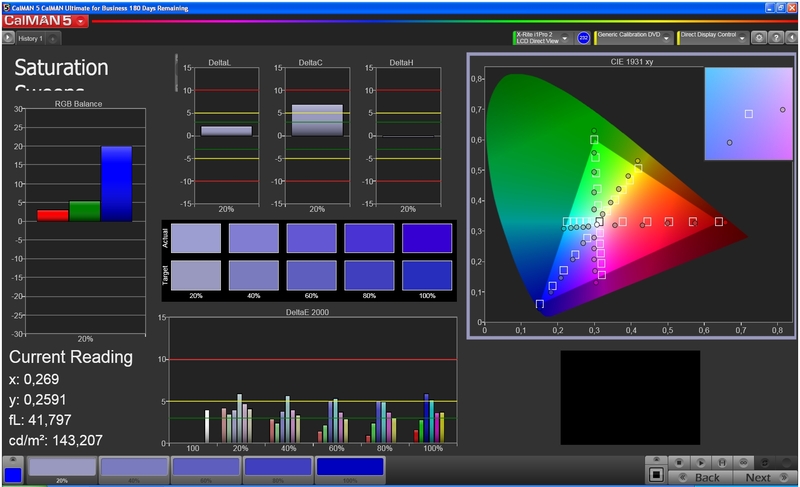 The seven MP main camera, which takes acceptable photos, is average at best. The light bar on the bottom edge gleams in different colors. The Xperia SP is a powerful member of the Xperia series. 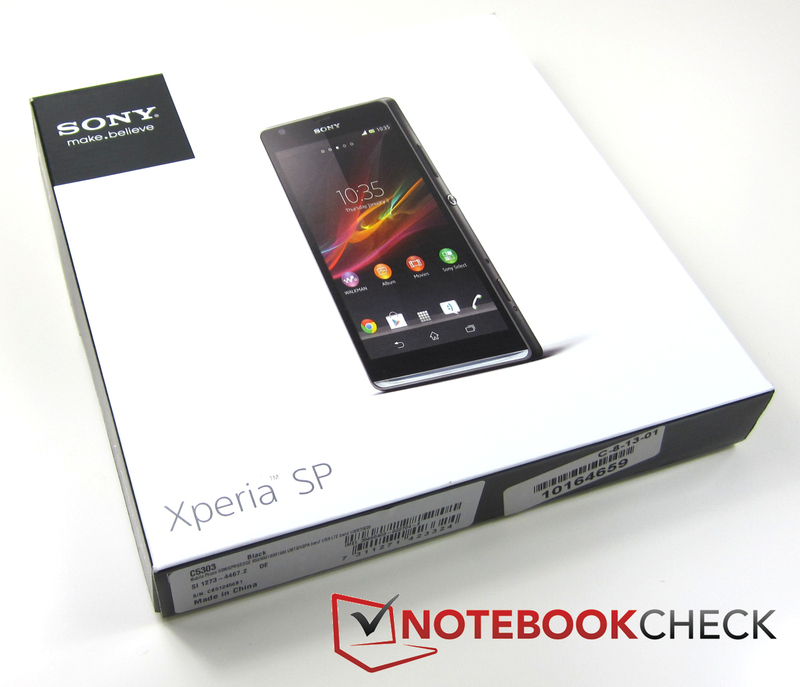 The Xperia SP convinces with its high-end and robust build quality. Distinctive: The power button on the right side of the case. 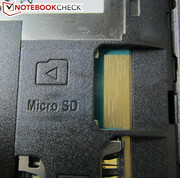 ... and a slot for micro SD cards with up to 32 GB. 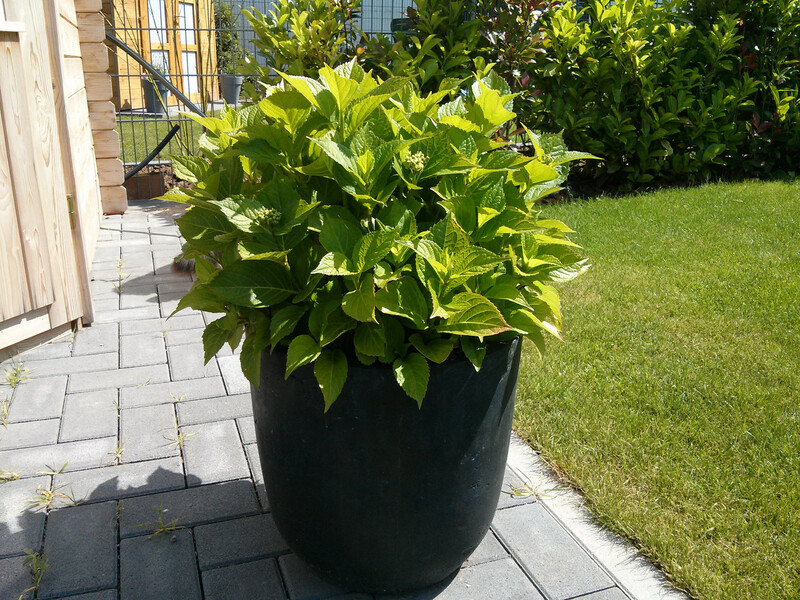 Despite heavy reflections, the Xperia SP can be used outdoors without problems. 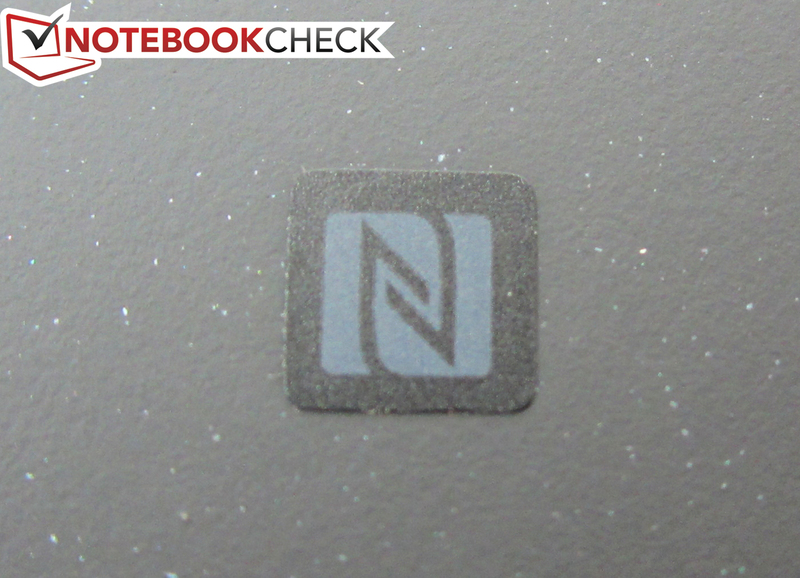 An NFC chip is built-in. ... a modular power adapter, in-ear headphones, a micro USB cable and a quick guide included. 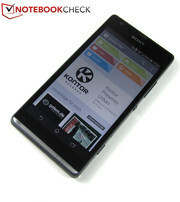 The Xperia SP is available in red, black, and white. 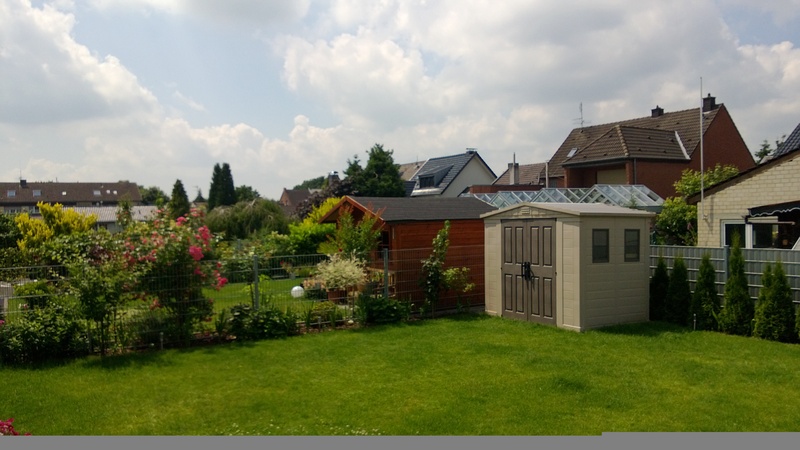 A typical result: Under maximum load, the battery is empty after 2 hours and 40 minutes. With the Qualcomm Snapdragon S4 MSM8960T the Xperia SP features a high-end SoC. 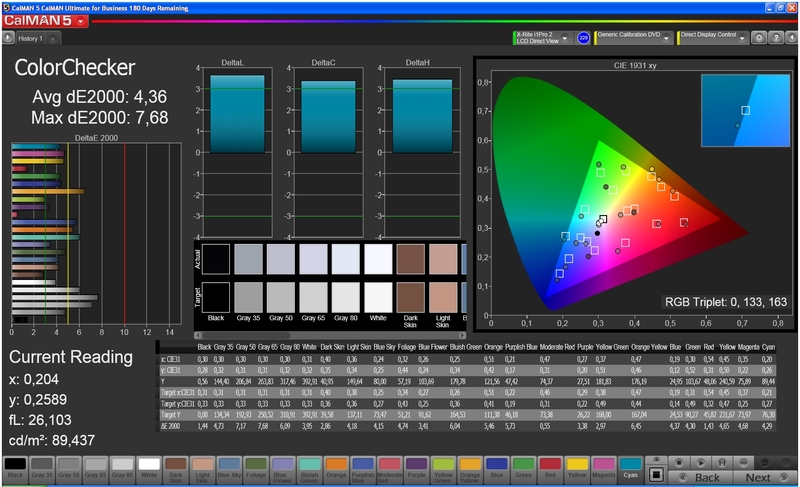 When should the light bar gleam in which color? 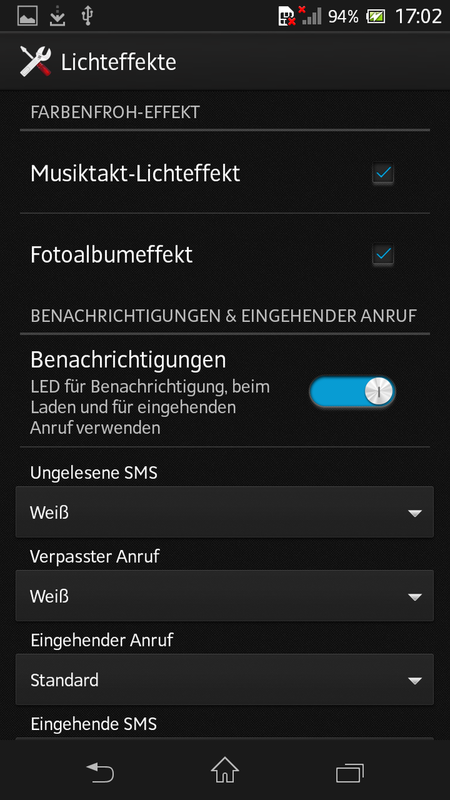 This can be precisely specified in the Android settings. 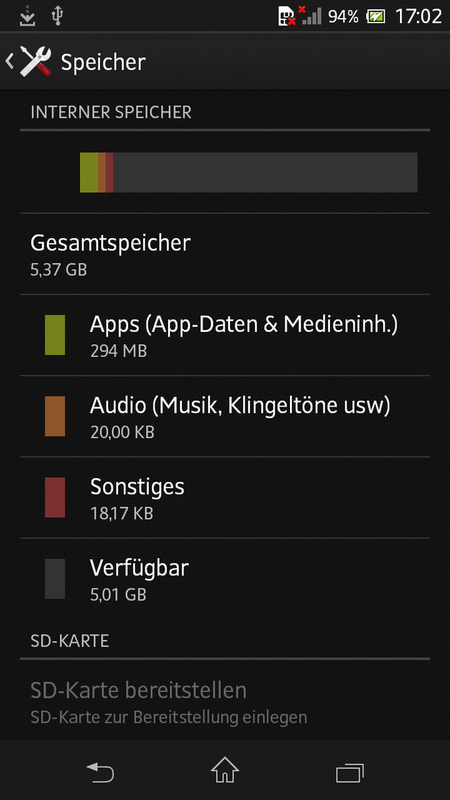 Nominally, the storage capacity is 8 GB, but only 5 GB are free. 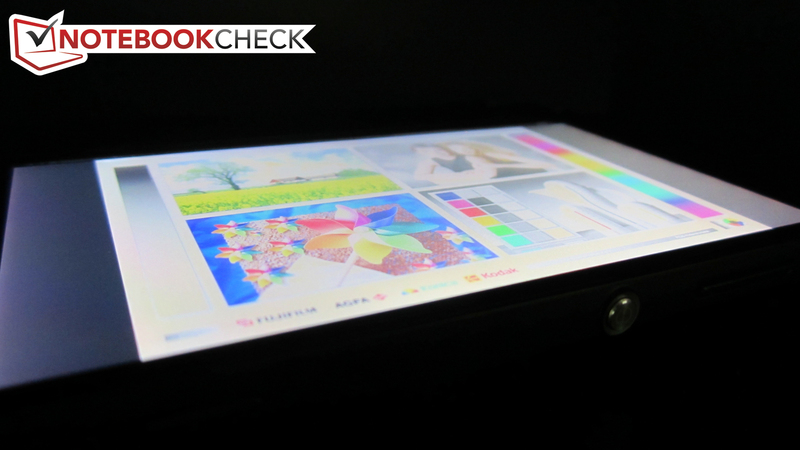 The bright display scores points with a decent quality. It is a nice feature that the main camera can record in 1080p. 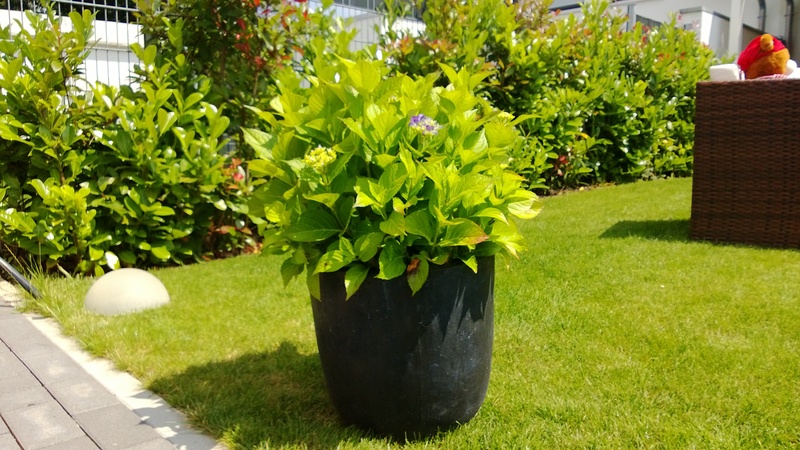 Resolution is not everything: Although the main camera can shoot pictures with 3104x2328 pixels, the image quality is not completely convincing. The throughout high performance of the Xperia SP, which completely suffices games and apps. Furthermore, the very smooth handling.